I found this a difficult book to read. It’s academic writing, with lots of references to ideas and philosophies and people and work that I don’t know, using words that I don’t know or know only in a more general sense, not the precise-in-this-field sense. It was also difficult because of my expectations, my desires. 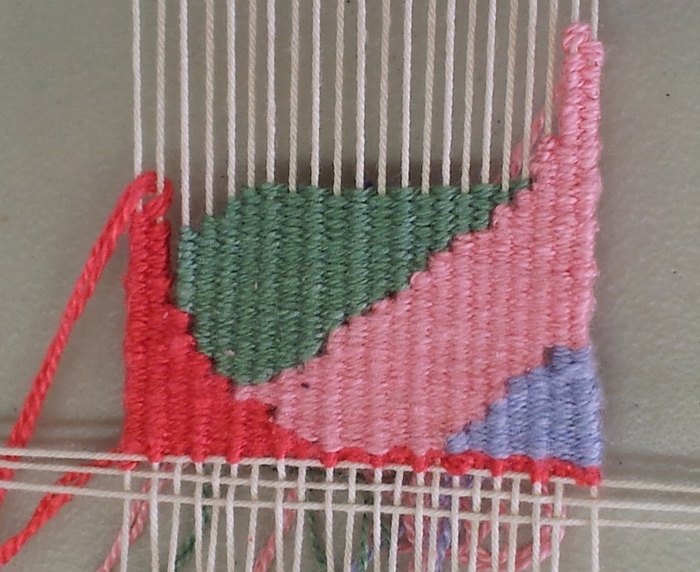 I want to find a compelling reason for hand weaving today. 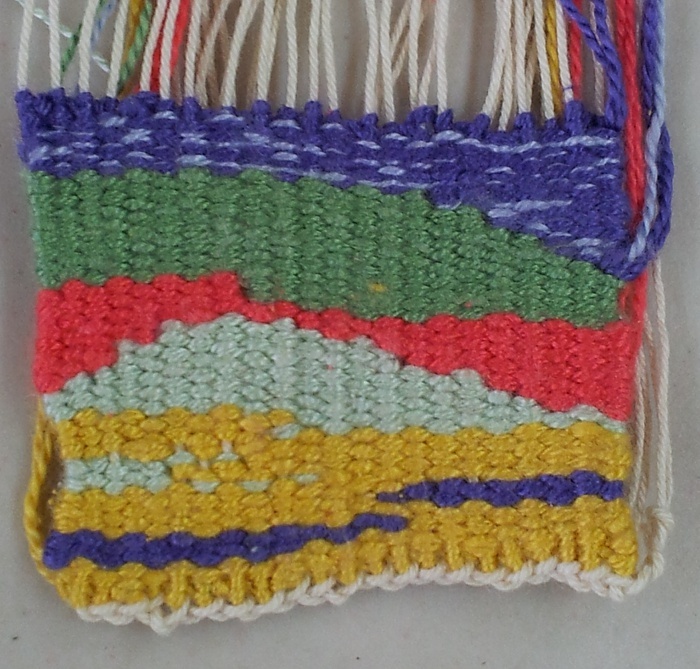 Not a joy of craft or handmade functional/wearable item way, but an expressive or conceptual way in which weaving provides unique perspective or insight. That may seem narrow, or a backwards approach, it may combine with other things or develop or change out of all recognition as I progress in my studies, but to me today “weave” seems to contain more, to offer more, to have more in processes and materials and metaphors and allusions and human history, than any half lifetime could explore. 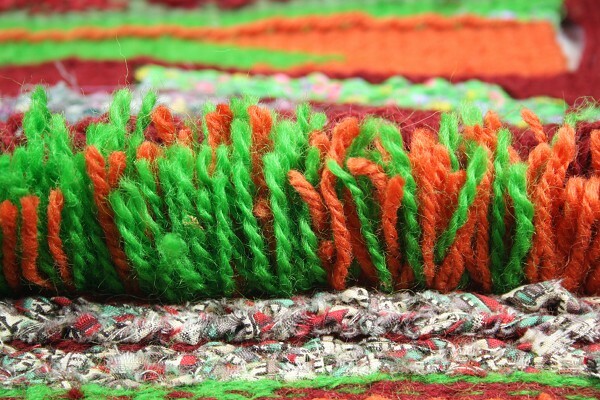 So a “weaving theory” – what answers would I find in weaving theory? None really for my personal quest, not in Bauhaus weaving theory. After reading this book I have more questions – which in the long run is probably more valuable. Smith’s book begins with the original manifesto for the Bauhaus published by founder Walter Gropius – an art-craft unity, joining “practical and scientific areas of work” (p. xiv). Weaving was there at the start, and continued throughout the Bauhaus history. And the weavers wrote about their work. “Through texts that explored weaving’s material elements, loom practice, and functional applications, a Bauhaus theory of weaving emerged” (p xv). 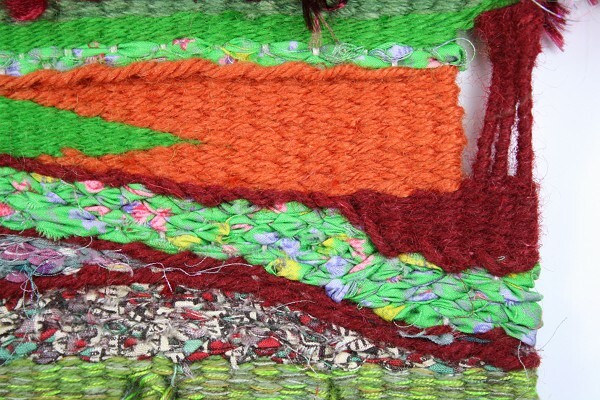 Their early weavings were “pictures made of wool” – not taking advantage of weaving’s specific nature, but translating other media, in particular painting. Later Anni Albers “argued that weaving’s processes, structures, and materials are best explored through direct experimentation on a loom” (p xvii). 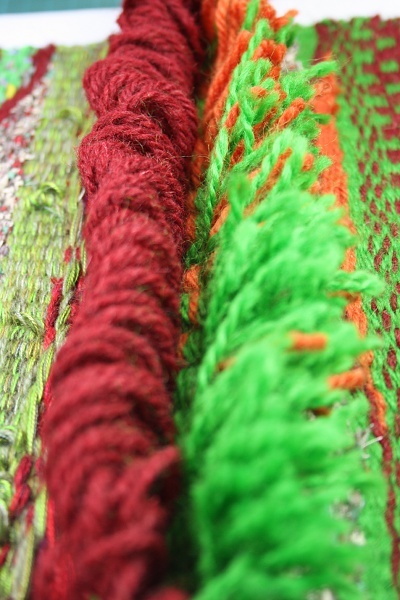 New fabrics were created from experiment, using advantage of what the medium weaving could offer. The book explores the changing goals of Bauhaus, driven by individuals, politics and economics. Gender issues are explored. In 1922 weaving generated significant revenue, more than any other workshop at Bauhaus. 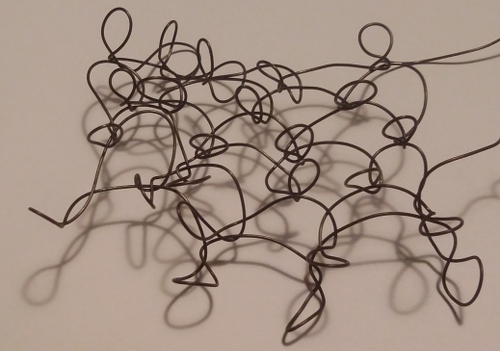 However its status was low – “As the social and economic history of textiles haunted the Bauhaus weaving work, the textile medium, it seems, was dismissed as mere labor, as ornamental form without ‘intuition’, whose ‘inner sound’ could only ever ‘simulate internal necessity'” (p 32). As time passed the Bauhaus developed a functionalist rather than expressionist approach. The weaving workshop responded. “At once modernist, or insistent on the distinctness of this thing and its space of practice, and acknowledging a specifically modern civic identity … early weaving theory joined together the rhetoric of functionalism, modern marketing, and the new women’s movement” (p 44). “Color and form as an abstract, autonomous terrain of inquiry remain integral to the object, even as it shifts toward use. Utility and formal concerns occupy the same matrix” (p 67). By 1931 Gunta Stölzl in her writing “declares that there is a rhetorical cleavage between … the development of textiles for use in interiors (prototypes for industry) and speculative experimentation with materials, form, and color,” she also insists that any ‘cleavage’ between utility and experimentation is also bound within the very structure of the woven prototypes” (p 67). [By this stage the theory is definitely moving away from my own agenda – but I wonder, what is the modern day’s art rhetoric?]. The third chapter of the book, “The haptics of optics: weaving and photography” struck some resonances for me, beginning with “tactility”, which for me is one of the great strengths and interests of textiles generally. “The Bauhaus weaving workshop explored the possibilities of color and formal composition through the interlacing of threads, tacitly placing it in comparison to painterly composition and architectural function. Yet the specific palpability of threads and cloth surfaces required a new set of terms” (p.79). Photography, able to show the “intimacy”, the textured detail, the tactile nature of a fabric, provided a new language. Previously I thought “haptic” was to touch as “optic” is to sight, but here I learnt it is more. Otti Berger “through a subtle and perhaps counterintuitive response to photography, … insisted on the tactility of different materials (the smoothness of silk or the roughness of jute, for instance) as well as the fabric’s contact with the kinesthetic movements of the body within architectural space (with curtains or upholstery fabric)” (p 81). Berger “queried the limits of the visual as modernism’s prized term of formal inquiry” (p 84). There is space and movement within haptic – is this part of the unique perspective or insight I am seeking? Moving beyond the visual to incorporate other senses? (I’m reminded of Hiromi Tango – see 30-Oct-2014). Smith continues to examine Berger’s work in the next chapter Weaving as invention: Patenting authorship. In a traditionally anonymous field, Berger sought acknowledged authorship of her textile designs. 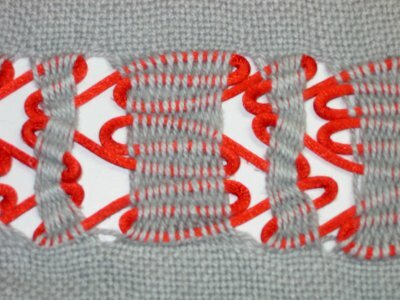 Her initials appeared on sample books. She took out patents on innovative work. “Berger was not the typically creative author-artist – at least insofar as that would have signaled the deep recesses of her inner life, the projection of her soul onto her work. But neither was she the anonymous factory laborer” (p 111). Berger was an inventor. Smith explores ideas around the inventor as author, the anonymity of textiles, a link back to gender. It was in the final chapter, Conclusion: On weaving, on writing that I lost my tenuous grip on Smith’s arguments. “Recall that the Bauhaus weavers, in their practice and in their essays on their craft, absorbed the languages of other media. In their wall hangings, for example, the weavers adopted the formal principles of expressionist painting; in their workshop’s prototypes for architectural textiles, they assumed the functionalist vocabulary of the Neues Bauen; for their fabrics found in Neue Sachlichkeit photographs and glossy magazines, they considered the limits of optical and tactile perceptions; and within patent documents, one weaver sought intellectual property protection for her textile inventions” (p 141), seems a good summary of earlier chapters. Much that followed was beyond my grasp. The subtleties of “media” or “mediums” are clearly important, but I don’t have the background knowledge to appreciate them. “Weaving is not just a set of processes: it is also, as I’ve indicated, a certain mediation of the semiautonomous zones of form and history” (p 172) I want to understand, I suspect is relevant to my own inquiries. The following sentence, “Textiles are so overtly bound up in the modes of production that define precapitalist and capitalist societies, and the gendered problematics that circumscribe labor, that they are rarely called ‘art'”, seems to point to areas I have been keen to avoid in my thinking, that I want to move beyond. So yes, a difficult book. It began as a doctoral dissertation, and it shows. There is nothing wrong with either of those things. I’ve learnt from this book and I’m convinced there is much, much more I could learn. I just need to work up to it. This morning I’ve been playing with ArahPaint, free software designed as “a drawing tool, which helps textile designers in editing pictures in repeat” (from the User Manual). It’s intended to support the first step in designing jacquard woven fabrics, but I was thinking of stamping and printing. http://avlusa.blogspot.com.au/2014/10/new-program-arahpaint-free.html The AVL blog which alerted me to the software. It has direct links to the software download, user manual etc. http://www.arahne.si/The Arahne website. Their main product is weaving software for jacquard and dobby looms, and there’s also a draping or texture mapping program which looks complicated but fun (there are demos for both, but I don’t think they’re open source). http://www.gimp.org/ Gimp is my preferred image manipulation software (also free). I found myself swapping between gimp (to adjust my basic image) and arahpaint (to produce pattern repeats) and it worked pretty smoothly. The windows snipping tool came in handy too. 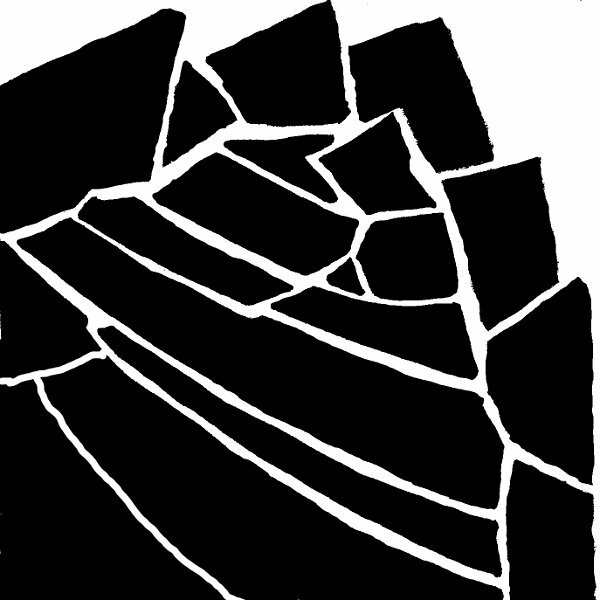 I used a design based on a shell, from A Creative Approach (sketchbook here and blog post 11-Feb-2012). A few of this morning’s new patterns are in the slideshow below. I didn’t get into the details of ArahPaint, just tried the things that worked without too much trouble. A few times either the program or I got confused, which was generally solved by starting a new image, closing and reopening the software, or getting a cup of tea. With my gimp experience most things worked pretty much as I expected, and the User Manual helped out. Overall a very useful tool which I will explore further when a project suggests itself. Jennifer Boldt, a postgraduatestudent of the Open College of the Arts (OCA) from Chicago, Illinois, has been shortlisted in the 3rd International Emerging Artist Award (OCA press release here). 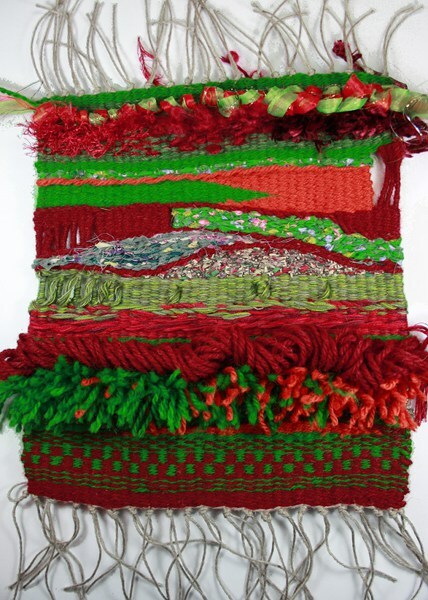 Jennifer’s work is an exciting, contemporary, use of weaving. This is absolutely the sort of work or approach to work that I want to get to. Even more exciting is that she has chosen to be a student at OCA. The undergraduate course doesn’t seem to have much specifically focused on constructed textiles and I sometimes wonder if my OCA studies are a diversion, an interesting sidetrack. Asked and answered? 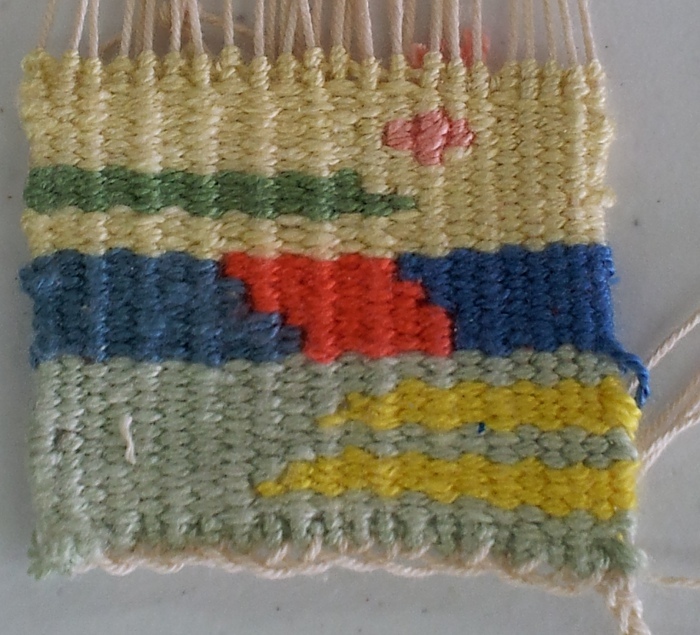 I had a wonderful day yesterday learning to make small silk tapestries. The class was taught by Marie Clews and Yvonne Eade (see some of her work in my post 2-Mar-2013), and organised by ATASDA. It was a really nice group of seven students. I thought it might be a relaxed, chatty sort of day, but apart from the breaks we were all very quiet and focused on our work. 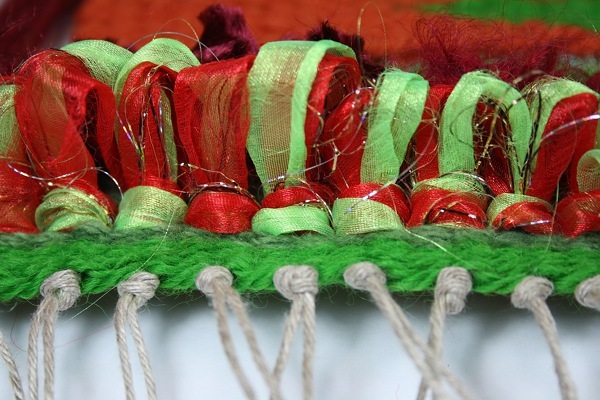 We worked on canvas stretcher frames and wove 20/2 silk using a needle. 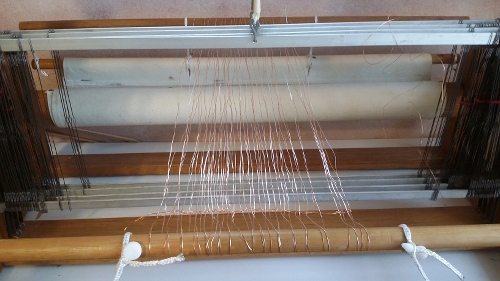 The warp width was 5 cm and most of us chose to weave slightly less to keep a rectangular shape. 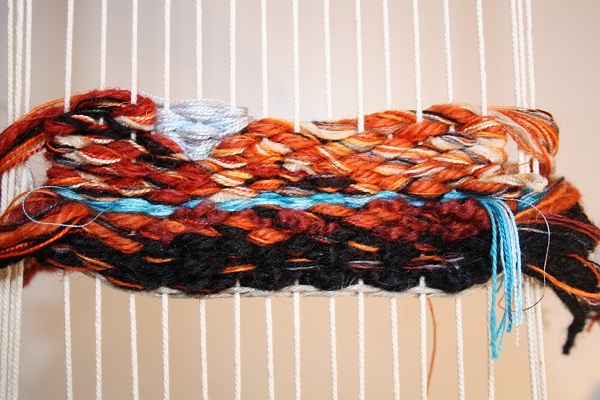 I am very excited about the possibilities with this – results with relatively small time investment; it’s small and portable, unlike most weaving; 20/2 silk is one of my favourite yarns and I’ve got lots of colours I’ve dyed in the past (for example see post 28-Jan-2011); it’s weaving! 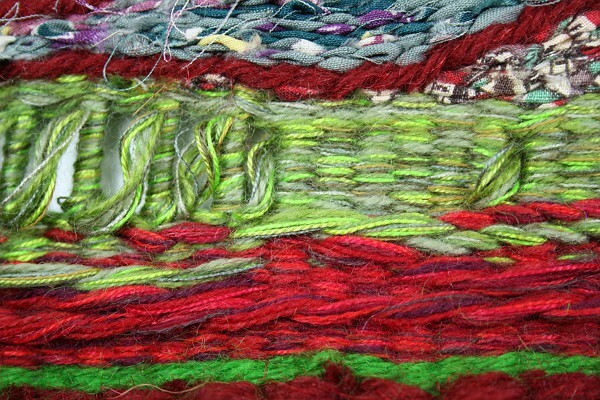 ; although I haven’t done tapestry weaving before, I think some of the ideas learnt from a rug weaving class with Jason Collingwood (see 23-Apr-2011) may be adaptable, and there’s lots more learning potential; the results could be taken further with beading, stitching, etc; I’ve already started thinking about lots of applications as special little elements in a work. Edited later to add: I can’t believe I wrote “I haven’t done tapestry weaving before”. 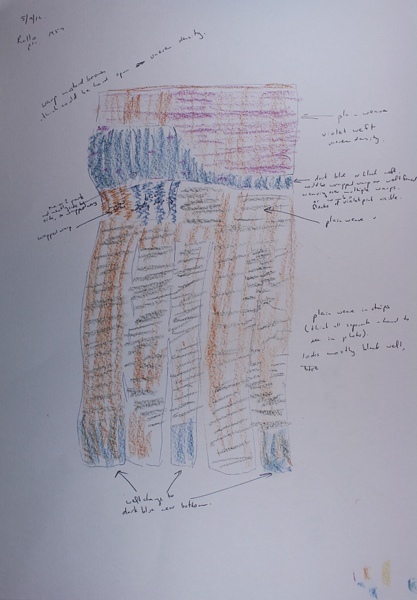 There was just Project 9 of Textiles 1: A Creative Approach (see for example my post 14-Oct-2012)! Ahem. It will be interesting to try some of those techniques on a smaller scale. See my post of 6-Nov-2012 for the initial work on this stage. 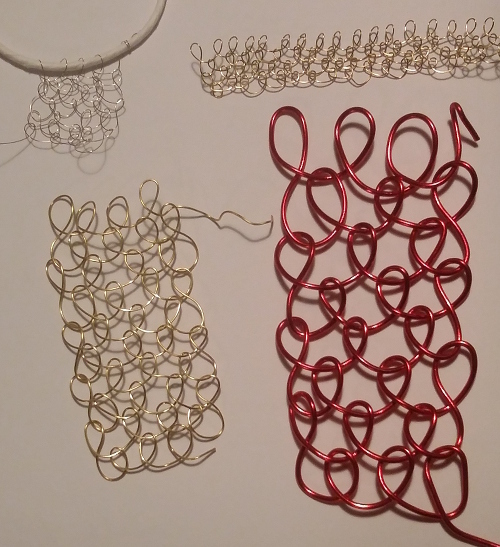 It was fairly well progressed, but with a major question mark about how well I could create shapes in the planned scale of the weaving plus a big gap in process with no yarn wrapping done. The first question was resolved pretty easily. 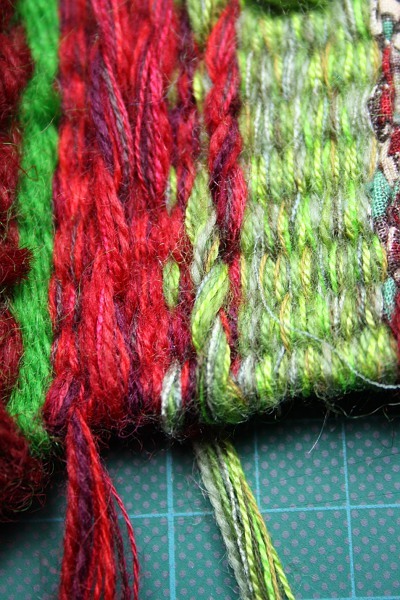 I put on my cotton warp and did a quick, temporary sample with the yarn bundles already developed. The angular shaping I wanted worked quite well and with a fairly wide sett I was able to get good coverage of the warp with my yarn bundles. (I just left the un-needed warp ends pushed to the side). Encouraged by this I went on to do a full yarn wrapping. This photo shows the original photo combination, the wrapping, plus a separate card to help me reproduce the yarn bundles. Clearly some of my colour mixes are quite different to the photo. Maybe they didn’t match the printed photo, but what about the photo on my computer screen, other photos from the island, and most importantly colours in my head from having been there just a few weeks ago? There are different colours in a couple of the build-up sketches I did where I had stepped away from the original images into a more geometric arrangement. 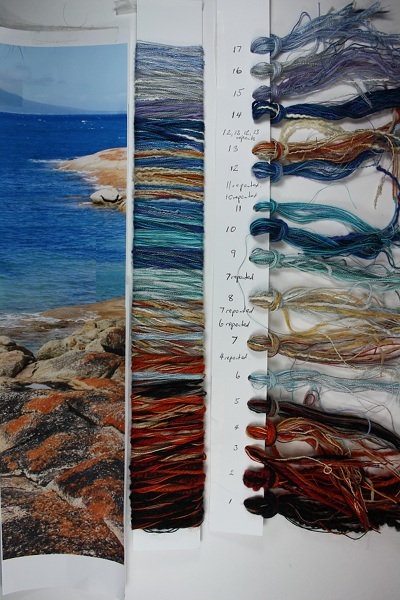 Add into all of that the colours that I think will look good together in a woven piece. My choice was to regard the photos as part of the inspiration and a guide, but not a “source of truth”. 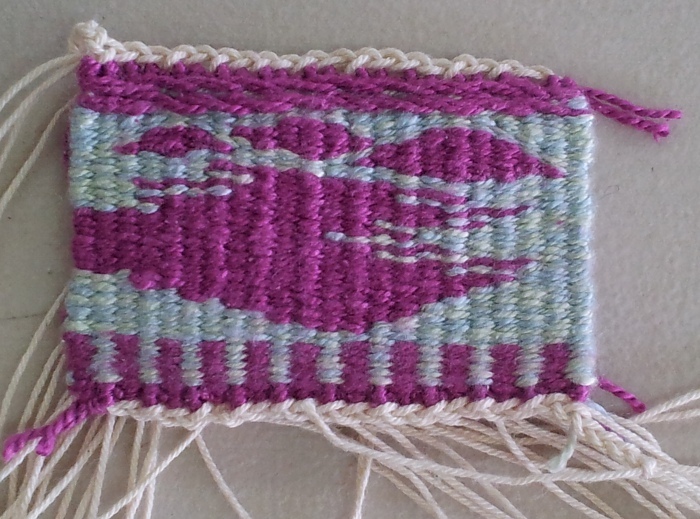 This turned out to be an ongoing battle during the weaving – holding on to my rather abstracted design and not reverting to a more literal approach. 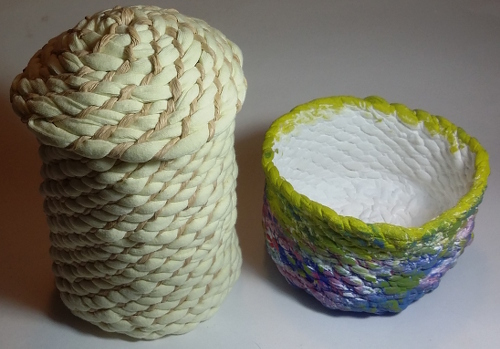 The finished work is about 41cm by 12 cm. It’s irregular in shape, but that’s less apparent in real life. Also the orange areas at the bottom are strong but don’t shout as they do in the photo. Generally I’ve been able to get the diagonal lines that I wanted. The image is more recognisable than I intended. I think the mixing of the yarns bundles worked well. At a distance there are clear blocks of colour (except for a mid-blue group in the middle below the point which is indistinguishable from the slightly darker blue to its left). Close up there is lots of interest when you can see the individual colours. Close or distant, the mixing provides good texture that works for both the granite and the water. I chose not to add any extra textural elements with soumak – it would have been out of scale and I think an awkward interruption to the main image. 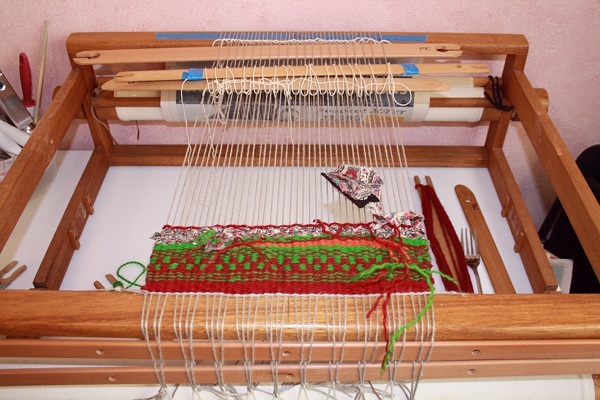 Plus it would be technically difficult – at times I had four weft bundles working at once, all creating different diagonals, and that was quite enough to think about. It was interesting to experience the impact of the preparation process. 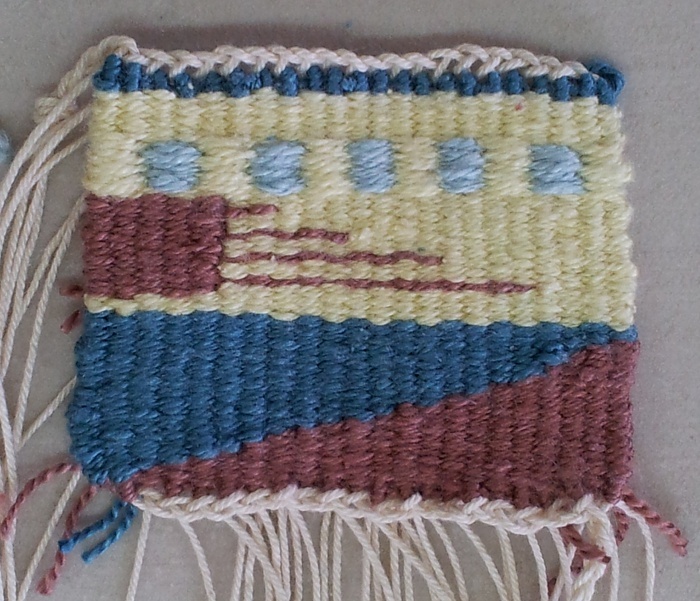 The early part of the weaving went fairly easily, even though I was still learning technique. However I hadn’t fully resolved the shapes around the rockpool in any of my sketches, largely because I didn’t have the experience to know what I would find possible in practice. In the event I was able to get some nice shapes – in particular that triangle of blacks and greys coming in from the left. The area near the top has a couple of horizontals, particularly the shore line of the distant island. This makes the work much more readable as an image and horizontals in the water were part of my original plan. On balance I like the variety it gives – but it would be interesting to see a version that continued diagonals throughout. This photo shows the inspiration photo, the final work and the sketch which first showed me how I could use the inspiration in a piece of weaving. To me it illustrates a bit more clearly my reasons or process in moving quite far from the photo colours, particularly in the foreground granite and lichen. The course notes have questions on specific areas of the project at this point. 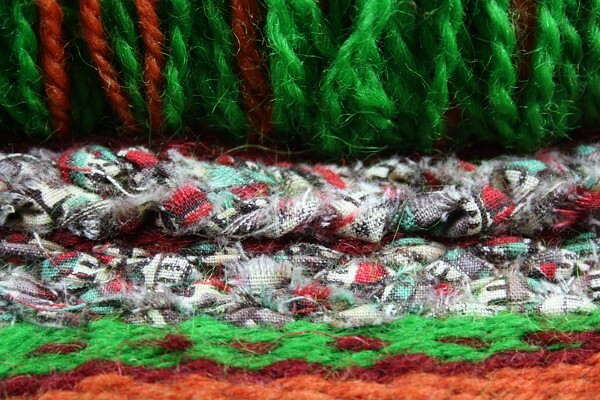 * Variety of yarns and other materials, and impact on look and feel of samples. 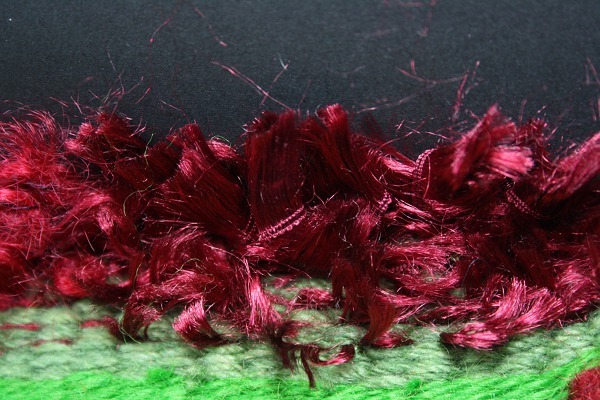 In the early stages (posted 14-Oct-2012) I used a variety of “standard” yarns – wools, bundled yarns, fancy knitting yarns and torn strips of cloth. In my larger sample in stage 3 (posted 21-Oct-2012) I re-purposed materials from hardware and jewllery-findings stores, plus spun various papers and kitchen goods. My final sample from that stage (posted 26-Oct-2012) was largely newspaper, neoprene and insect screen. 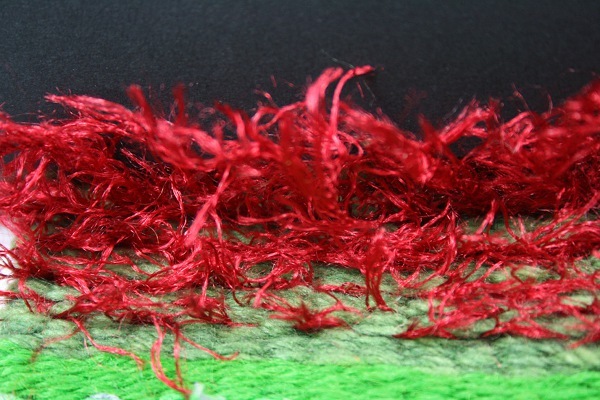 The sample from stage 4, shown in this post, returned to more traditional yarns – a wide variety of natural and man-made yarns bundled together. 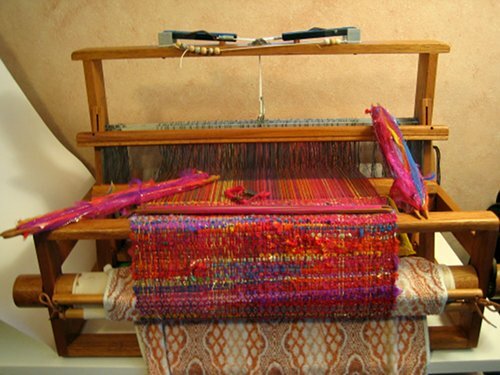 To my surprise weaving accepts, accommodates, tames and unifies them all. There is beautiful visual texture from the newspaper, forming my pebbly beach. 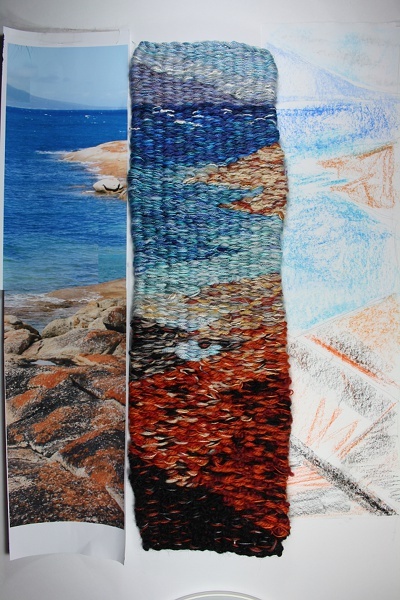 Creating the yarn bundles above posed different challenges to spinning newspaper, but the results were just as effective in their own way in suggesting a rugged shoreline. In my weaving in the past the specific materials were critical – for example the combination of 20/2 silk and a laceweight Cashmerino (70% merino, 30% cashmere) in a deflected doubleweave scarf (posted 25-Oct-2009) to create a beautiful texture by taking advantage of their different properties in washing. I wouldn’t want to wash any of these new weavings! 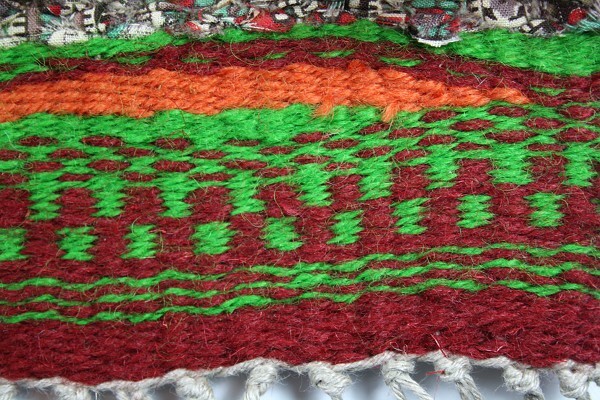 * Weaving compared to other techniques. 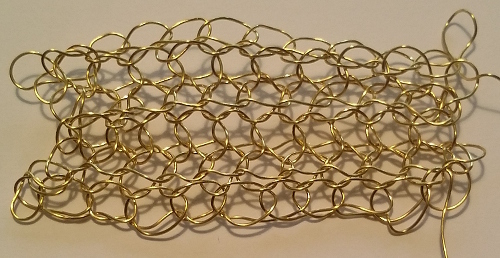 This was not weaving-as-I-knew-it, but I still found it very enjoyable and absorbing. I love the whole idea of creating cloth; that the image or pattern is integral to the very substance of the result, not just added in or painted on. It seems more personal, more thoroughly an expression of my self. 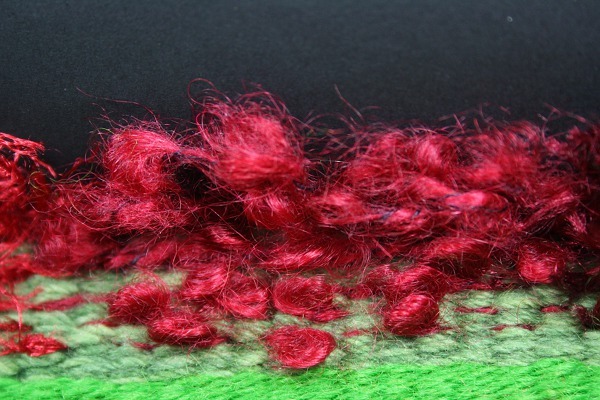 It could be seen as slow, but french knots are slower. 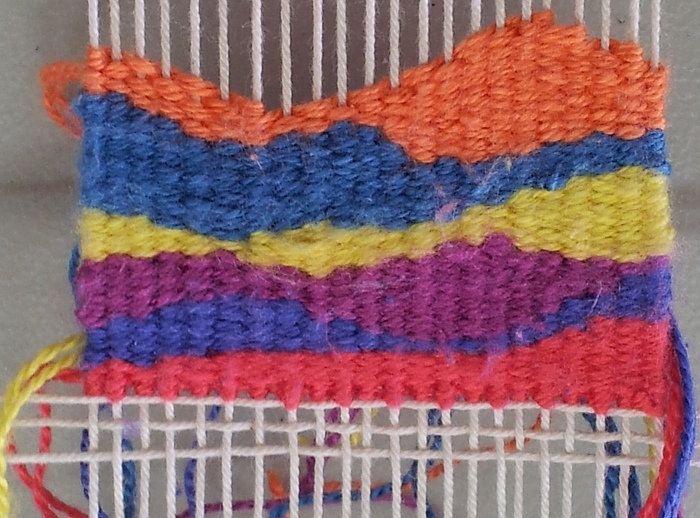 It could be seen as repetitive, but especially with this style of weaving I was making decisions and watching for possibilities all the time – although in honesty I enjoy the repetitive, alert meditation of “standard” weaving. It has its limits, as does everything – for example I abandoned my ideas about grasses on a beach. 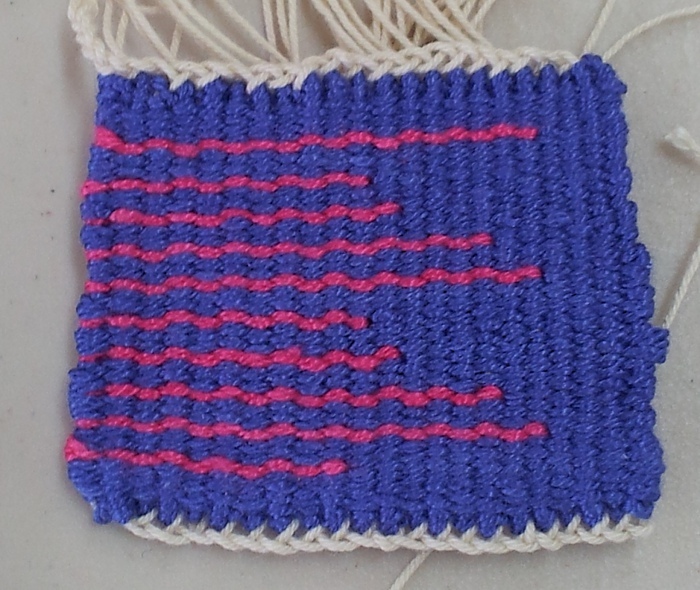 I’m really looking forward to combining weaving with other techniques more. * Aspects of the final sample. The quick answer is that I like it very much. The proportions work well with the diagonal design and the depth of image that I wanted. I think the textures work well, and there is a variation that supports and enhances the design. 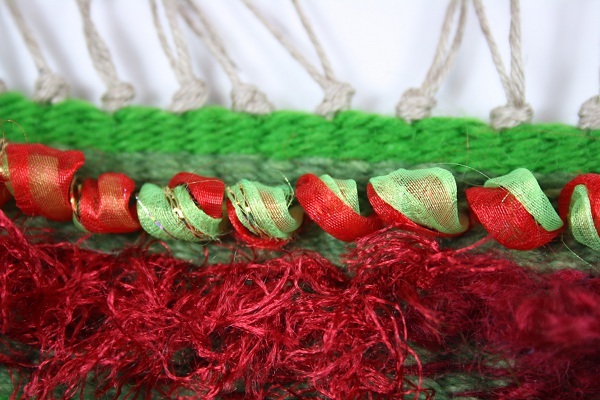 The lumpy, uneven shape is distracting – a combination of poor technique and differences in thickness of the yarn bundles, plus my choice of equipment could be a factor. I wouldn’t want to change the yarn bundles, but better technique, experience and slowing down a bit could help. There’s an area just below the outcrop of rock where I intended different shapes, but my yarn choice was poor and two of the shapes merge. The fix there is clear! Also as mentioned above it would be interesting to try a version that stepped further from the original image into a more pure play of colour and angles. It’s quite clear to me that I got a better result by attending to the design process. I did _not_ want to do the yarn wrapping. I felt I had done a few trials and that going further would be just a formality with no particular benefit. Instead I found it helped me to focus and identify problems in my initial yarn bundles. Based on the wrapping I made a number of improvements as I went. One that didn’t work was in the blue area already mentioned. With hindsight I should have done a second wrapping or adjusted the first until I was completely happy. 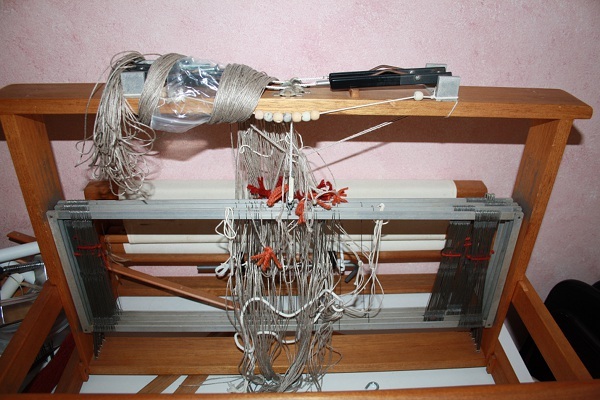 At the time I felt I was getting stale and would loose enthusiasm for and interest in the actual weaving. * Working from source material versus putting colours together intuitively. In the past I have thought of a theme (say “hydrangeas”), looked through some photos, but made the actual yarn choices from memory and emotion rather than carefully analysing source material. In the final sample I enjoyed the hybrid approach (apart from concerns about not meeting the assignment brief). Careful experimentation and planning allowed me to refine choices and correct mistakes. That didn’t work entirely, but I think I prefer to risk a few mistakes (aka learning opportunities) rather than rigidly locking in choices and not having the flexibility to respond to the work in front of me. There were some colour problems in both my final sample and the seaweed/stoney beach sample – but I think experience will help me avoid similar problems in the future. Re-reading the above, I see quite a bit of conflict in my responses. Do a second wrapping to refine colour choices, but risk errors to allow flexibility. Well, I’ve long thought that consistency is over-rated. More seriously, I feel there is enjoyment and risk in both approaches. I wouldn’t want to rule out either.